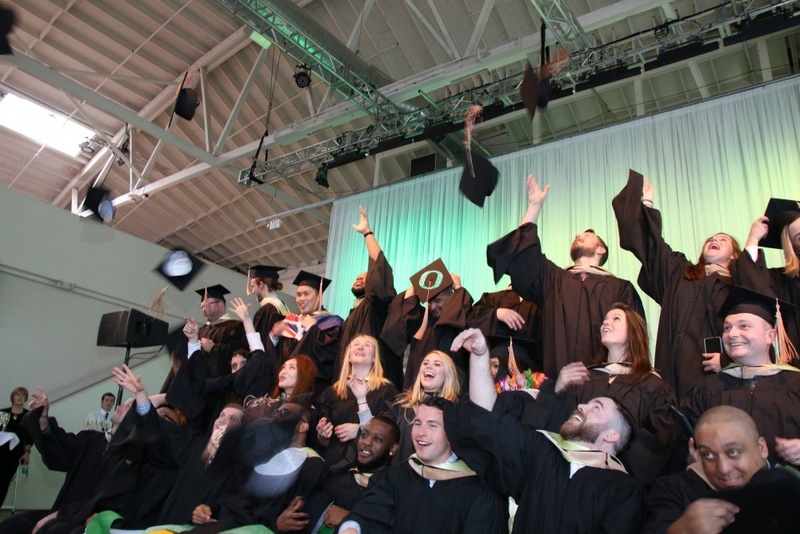 While UO Portland’s Sports Product Management Program graduated its first class several weeks ago, the architecture and Oregon Executive MBA students have been receiving diplomas in Portland for more than 30 years. The contrast is striking considering that overall, 144 students will become graduates from the Portland campus this year, both from established and new programs, many with employment already lined up. “It’s exciting to see one-third of our students graduate this year to embark on a variety of careers within several different industries,” said Linda Favero, assistant dean of students and career services. In the law school, 24 students graduated in May, with several accepting positions at Davis Wright Tremaine, Barran Liebman, Schwabe Williamson & Wyatt, the U.S. District Court of Oregon and the Santa Barbara district attorney’s office. All graduates are expected to take the bar exam in the next 10 weeks. Architecture and allied arts have upward of 40 in the graduating class, both undergraduates and graduates, of which many will move on to work at architectural design firms, planning firms and doctoral research projects, according to Favero. The Oregon Executive MBA program will see 38 graduates, all of whom have established careers but enroll in the program to broaden their understanding of the full range of business functions so they can move into C-suite and general manager roles. Fifteen students will graduate from the School of Journalism and Communication, then begin at positions at the Blazer’s Edge, Muse Storytelling, Portland State University, TriMet and Oregon Wine Press. The inaugural sports product management class of 37 students graduated in March, many with jobs or offers already in hand with Nike, adidas, Bolt Threads, Sorel, Deviation Snowboards and Revant Optics. While several programs will host receptions in Portland, all graduates are invited to the campus in Eugene for the main ceremony June 19.